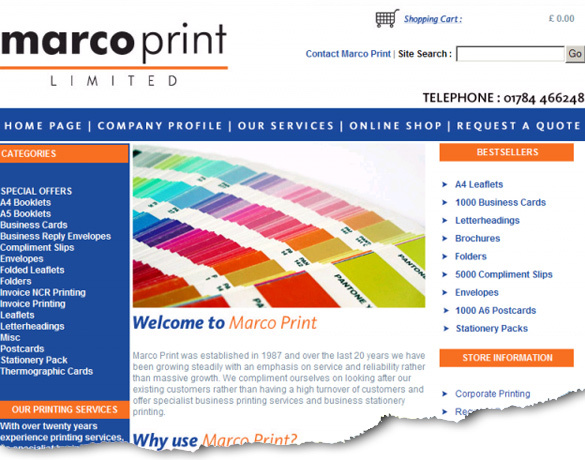 Marco Print approached us regarding a new website for their Business Printing business. They were also interested in achieving a high ranking for their site. Sims Designs designed the site with seo in mind and we then optimised the website pages for the clients chosen search terms. As it was a new site patience was the key. The site was going to take a while to filter into the search engines, so a so a steady link building campaign was started. When adding links to a new site it is crucial not to go too mad too soon. Our patience paid off and the client is now enjoying a high ranking along with a very good looking and effective ecommerce site.